Picture yourself walking down the runway wearing an outfit you designed and created yourself! This course introduces the student to the exciting, fast-paced world of the Fashion Design Industry. Students learn about the design process, about apparel wholesale and retail markets, and about the latest fashion trends. They also use sketching techniques to create a portfolio that includes the initial stages of product development, as well as research, logo development, and final clothing line. 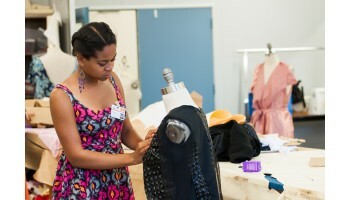 Students learn appropriate fashion terminology, and are introduced to the production and marketing of the fashion product, as well as to the overall structure of the fashion industry. The course culminates in a student produced fashion show! Mina S. has successfully found employment as a Hostess after completing course(s) in Fashion Design. Carina C. has successfully found employment as a C.N.A. after completing course(s) in CNA Homehealth Aide.